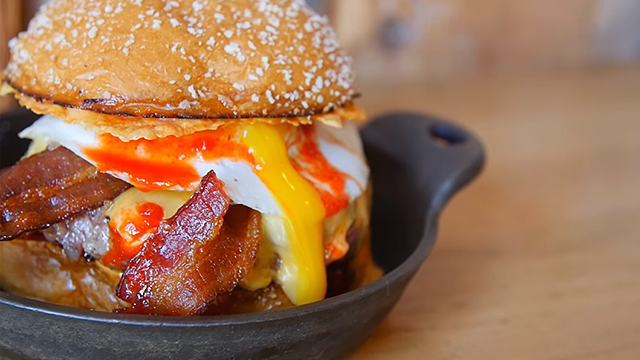 These Videos Will Make You Stand Up And Go Somewhere To PIG OUT! If you're on a diet, look away now. Happy Friday the 13th weekend, FHM Nation! What are your plans? Going out for a movie date with the #bae? Are you subjecting your liver to yet another bout of alcoholic torture? Or are you content with just going home to "iflix and chill"? Here's a suggestion: FOOD TRIP! If pigging out is not part of your TGIW menu (pun shamelessly intended), the trio of absolutely drool-worthy videos below might just make you change your plans (that, and help you learn more about the wonderful world of food). Seriously, these will make your tummy growl like a lion on the prowl. Sausages, ribs, brisket, turkey—this video has everything carni-bros want (look away, vegans), all arranged in a really greasy plate that (we imagine) smell like meat heaven. By the looks of it, the whole set can't be consumed by one mere mortal so, if ever you're faced with a similar sight, be sure to call backup (we're just a Facebook PM away). Man, making authentic pizza takes a lot of work (just imagine how tired a pizza maker's hands are from kneading dough all day). But the result, as you can see (and taste if you're in a pizza parlor somewhere, you lucky you), is all worth it. The burgers you saw in the video? Tasty. They're also not of the run-of-the-mill kind, thanks to a key ingredient called "ketchup leather." It's basically solid ketchup in the shape of square cheese slices! The guys of Plan Check, a resto-bar in New York, make it by heating a tray of ketchup in the oven to solidify the condiment. Hooray for tasty and less messy buns! You could also check out our weekly Chill Out Guide for more gimik inspirations!